"Looking after my clients like they’re my family. I’m committed to working hard for you." 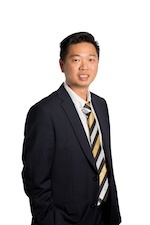 Dominic Yen has over 12 years’ experience in banking and finance, having worked in a variety of roles across the retail banking and lending industry. Starting his career as a teller at National Bank, Dominic moved into a role at GE Money handling personal loans and hire purchase agreements, followed by a number of years at three of New Zealand’s largest retail banks as Banking Advisor and Business Manager. Passionate about helping his clients, Dominic’s knowledge of finance and the mortgage industry is something he looks forward to sharing with his clients. Based in Auckland, Dominic provides advice about various home loan products, including fixed or variable rates, revolving credit, Low Doc / No Doc. He can also assist with bridging finance, reverse mortgages and construction loans advice. Dominic speaks Taiwanese, Mandarin and English, and is available after hours to meet at a time and place to suit his clients. A Registered Financial Adviser (FSP608049). A copy of my Disclosure Statement is available on request and free of charge.